Meat Meatballs made from Brodo Bonanza – Loving these Leftovers! In the days of yore leftovers were, we all assume, a necessity. Necessity turned out to be the mother of culinary invention when it came to making the most of any meat left over from making Brodo (see my previous post). Since the meat in question simmers for at least two hours, more like three, let’s face it: a lot of the juice has simply been leached out of this boiled meat. Which doesn’t mean it can’t be taken to task, and that’s the good news. The meat is magically transformed into tasty meatballs, fried ones at that. And you know me, the Fried Food Fanatic ! Boiled beef, parsely, garlic, lemon zest, breadcrumbs, 1 egg, grated parmigiano reggiano cheese, good quality frying oil (I used Quattroicocchi’s olive oil, a prize winning evoo, because I think these polpette di lesso deserved it). A good oil to deep fry with is groundnut oil. Salt and pepper. Chop the parsely and garlic. Chop the boiled meat. Dip some bread in the brodo. Add this soggy bread to the bowl containing the meat, parmigiano, parsely and garlic, grated lemonzest, and then add a whole egg. Sprinkle a little salt and white pepper, also some freshly grated nutmeg if you like it (I do). Shape into balls. Coat the balls with breadcrumbs. Deep fry in good quality frying oil. Serve hot. They can be accompanied by Mostarda di Cremona, by ketchup even!, a drop of tabasco, salsa verde, mustard … or just enjoyed on their own! This is what Mostarda di Cremona looks like … spicey candied fruit in syrup. These polpette di lesso should not be thought of as merely ‘frugal’ … if anything, they are faux frugal and restaurants in Rome pride themselves on having them on their menu. About ten years ago, I attended a cooking class at the Gambero Rosso premises just off Viale Marconi. The interior was new and exciting, escalators and three floors, shops and wine bar etc., and there was a fab atmosphere at the time. The theme that night was regional specialiaties from Emilia Romagna and pride of recipe place went to the making of tortellini. It was conducted by chef, food historian and writer Sandro Masci who now runs another cooking school in Rome (Les Chefs Blancs) and it was thanks to his charm and good will and sheer didactic proficiency that I was able to even get through the trying process of rolling teensy weensy meat balls (think the size of a finger nail) and then couching these balls in doll-sized handkerchiefs of stretched pasta (3cm by 3cm). They tasted fantastic, however, I have to say – nothing like the shop bought ones I normally would use which were never ‘bad’ as such – just not nearly so tasty. And so, nothing loath, a few weeks later I ventured to recreate them at home. I started out enthusiastically enough, I have a good relationship with enthusiasm, but it was short lived. It was easy enough to make the home-made pasta and roll it out (I’m good at that). Weighing and cooking the filling, also easy peasy. But then came the Lilliputian hand-rolling routine and it didn’t take long before I got flustered. Much sighing, raising of eyes up to heaven, biting of lips in frustration. So much so that I called upon my next door neighbour, inveigled her into coming over for a cup of tea and a chat, and innocently asked her to kindly give me a hand with the dastardly dwarfish meaballs. How could she not comply? We chatted for well over an hour, put it that way: that’s how long it bloody well took. So these days, when darling husband goes to Bologna for work, I make sure we buy the tortellini from there. They come at around Eu40 per kg, so not cheap, but then neither is medication for high blood pressure, now, is it? What to do? What to do? is the head-scratching question as regards stuffed pasta in delicious bouillon. And ‘brodo’ is the Italian word for bouillon or meat stock/broth. Answer: change region – nip over to Lazio and make “cappelletti”, meaning “little hats” instead! The filling is more or less the same but aha! the size isn’t ! Yeay! These little hats are much larger and easier to deal with than their cousins, the finicky Venus’s belly-button-inspired tortellini. Hats off to that! (Would anyone care to count the number of exclamation marks in this paragraph … that is my sense of enthusiasm escalating). Just the other day, even though the temperatures didn’t warrant it, I thought I’d make soul-warming brodo and home-made cappelletti. The meat stock of the brodo produces a lovely soup for the cappelletti to cook and be served in. Number one. Then, the meat used to made the brodo can be eaten as as “picchiapo” Number Two, and as “polpette di lesso”, Number Three, both of which are typical Roman dishes (one can also eat the boiled meat accompanied by a salsa verde or by the spicy candied fruit in syrup, known as Mostarda di Cremona – and that would be recipe Number Four). I call this abundance of recipes a bonanza, a Brodo bonanza. 100g Parma ham, 100g Mortadella, 100g pork loin (the Butcher looked at husband in disbelief when he ordered that amount of meat and my husband had to reassure him that it was for a good recipe reason!) 1 bayleaf, 20g butter, 1 egg, 135g parmigiano reggiano cheese, freshly grated nutmeg, freshly grated white pepper. If you look at the following photos, it will be easy to understand what needs to be done. The cheese needs to be grated. The pork loin needs to be cooked on both sides in the butter flavoured with the bayleaf. Allow to cool and then add all the ingredients minus the bayleaf in a processor and use the pulse to turn them into a sticky mince. Place in the fridge for at least one hour. It can be frozen too by the way, for future use. And then the pasta has to be made: 100g flour per 1 egg is the rule of thumb. I used two kinds of flours, half and half, one was 00 Italian flour and the other was the Semola flour (durum wheat flour, the kind used for making dry pasta). I didn’t take photos but I assured you that I placed the flour and eggs in the food processor and blitzed them into a dough. Easy enough to do with a total of 300g of flour and 3 eggs and a tiny dribble of olive oil. I then wrapped the pasta in clingfilm and put it in the fridge. Normally I wouldn’t do that. I would just let it rest at room temperature – but since I was going to roll out the pasta the next day, the fridge made more sense. And roll it out I did too … 24 hours later. It was getting on for 7 p.m., or Wine o’Clock as I call it. I asked my husband to put some music on after he kindly grated some parmigiano … he picked something from long ago that he knew had a special meaning for us, and eventually felt inspired himself to play some music. He got out his sax and accompanied the songs. It was truly a really nice atmosphere. Listening to music, playing to music, nice converstion and a sip of wine. Now that’s the way to cook! I have always been convinced that people’s moods and ‘energies’ go into their food preparation. So … the mood was good. So good that I decided to cut corners and prepared these cappelletti in a no-no-no that’s-not-the-way-to-prepare them way –and aesthetics be damned. Take a look and laugh will you, laugh with me and not at me ! I actually got out my tape measure and made slits 4 cm apart, horizontally. I then measured 4cm vertically, and used a plain ol’ paring knife to cut the rolled out pasta into 4cm squares (well … roughly 4cm, and roughly ‘squares’ too – sometimes they looked more like rectangles). Yes, yes, I know. I could have used a cutter … but I couldn’t for the life of me remember where my cutters were exactly, and at that point I didn’t really care. Once I had cut out all my squares … I proceeded to make long sausage shapes out of the filling. And that was pretty ‘fiddly’, let me tell you. It helped when I wet my fingers. And as you can see, there is one little rolled up ball of filling in the centre of a pasta square. And now to shape the cappelletti. Fold the pasta square in half, and make a triangular shape. Careful not to place too much stuffing inside it. Get the left ‘ear’ and the right ‘ear’ to meet in the middle, press hard … and Bob’s your uncle! It doesn’t look very good, and that’s cos I put too much stuffing inside this cappelletto. There … these look better. I could see that there were plenty of cappelletti … so I stopped making any more. Just to give you an idea: I had used about one quarter of the entire filling mix! So as you can see, a little goes a very long way with this recipe. The amounts I gave you are enough to feed 8 very hungry people or 10 normally hungry dinner guests. This is a photo attempting to show the cappelletti simmering in the brodo. Very steamy as you can see. Time to eat. The cappelletti don’t take long to cook: about 5 minutes. Serve in a bowl and shower more grated parmigiano over them. Very much worth making, I promise you. They can be made in advance and can be frozen. I am only too aware that people are often in a hurry when it comes to surfing the net for recipes, so I would like to warn the reader that he or she can safely skip all the preceding paragraphs below until they get to “Ingredients”. On the other hand, I would also like to recommend this recipe: I think it can be a crowd pleaser on account of its ingredients, its ease of preparation, its relative lack of expense, and most of all on account of the flavour it delivers. What do you do when your friend of fifteen years tells you that her job requirement now stipulates she be posted to Samoa for a couple of years? You burst into tears, that’s what. I had to look up its exact location on a map but I knew of course even without precision that it was far away, far far away from Italy. Sigh. Another friend leaving, yet another. As I wrote in my previous post, Frascati has been home to me ever since I was a child of under two, even though from age five onwards I lived overseas on account of my stepfather’s job. That meant changing schools: my first in Karachi-Pakistan, second in Teheran-Iran, third in Frascati (albeit for only a couple of months), fourth in Dhaka-Bangladesh (which when I was there was Dacca-East Pakistan) and fifth and final was boarding school in England for an uninterrupted six years. Growing up abroad provides many enriching experiences and nurtures countless cultural advantages but it also poses one huge disadvantage: you make friends and then either they or you have to ‘leave’ – leave the country. It’s a funny feeling, that one of being ‘left behind’, it is steeped with melancholy. And though exciting at some level, being the new person on the block comes with pitfall baggage and requires not a little amount of courage. Looking on the positive side, I suppose that all of this also teaches one the art of making friendships ‘easily’, of not beating about the bush, and hones one’s radar as to who to reach out to and who, well, it sounds awful but you know what I mean, who to avoid. Sometimes one can’t ‘avoid’, however … and thereby context and necessity can end up being the parents of close acquaintance. Well, whatever social demographic we fit into, all I can say is that we have had plenty of lunches and dinners together, so food must also have played its part. Just days before leaving for Samoa, Alison gave me some food stuffs from the pantry she was vacating that she knew I would appreciate, including some black lentils from the north of Lazio, a region called Tuscia. Here she is, a little tired after a long day, and with her beautiful dog Lucy at her feet. But last minute work and preparations meant that she could not join us for a gals get-together weekend on the Amalfi Coast. We missed you Alison!!! And we also missed common friend Charlotte from Denmark too, who was to arrive the following week, just in time for a big birthday of mine. A few days later, I was having some neighbours over for a fish and seafood-themed dinner and looked at those black lentils Alison had given me and came up with an idea. I ‘borrowed’ a seafood salad recipe idea from Liz, I made use of the frozen fish stock that Sandy had made in the course of a dinner down on the Amalfi Coast, and made up the rest myself in honour of Alison. From now, this is going to be called the Alison Lentil and Scampi Salad. I expect you can get great seafood in Apia, Samoa, Alison? If you can get hold of some ordinary lentils, not even black ones, have a go at making this recipe, I’m sure you’d really enjoy it. And melted butter in lieu of olive oil, if it’s hard to get there. May your God go with you, Alison, as Dave Allen used to say. Scampi, fish stock preferbly made from scampi shells and/or water if fish stock is unavailable, lentils, celery, red onion, olive oil, lemon juice, ice, salt and pepper. This was the fish stock Sandy made in Maiori. I very wisely froze it and wasn’t going to waste it and took it back to Frascati with me. Good fish stock is something to be hallowed. Cut up an onion into bite-size pieces, and chop celery sticks likewise. Place them all in a bowl full of cold water and ice. This will make everything nice and crispy and will take the edge off the onion. I happened to have a red onion called ‘cipolla di Tropea’, which is very very sweet. Set aside. I didn’t know whether these black lentils were going to be too toothsome, so I decided to let them soak in plenty of water for an hour. Normally, lentils don’t need to be soaked but I didn’t want to risk it. Then drain the lentils. Dribble a good amount of olive oil (by olive oil I mean the best evoo you can muster) into your pan. I opted for an earthenware cooking pan, because they are just super duper for low-heat slow cooking. Once the lentils are in, use your hands to make sure they all get coated with the olive oil. Then pour in enough of the fish stock to cover the lentils plus another two inches. Reserve some fish stock to cook the scampi too. Bring to a boil, and then reduce the heat. After a while, some unsightly scum will rise to the surface. Get rid of it as best you can, a slotted spoon works pretty well. Taste the lentils after about 20 minutes. Keep an eye on them. It turns out that they were just right after 40 minutes cooking time. Remove from heat. Clean out the pan, dry it. Add plenty more evoo and lots of lemon juice and pinches of salt. Put the still-warm lentils into the pot … and stir away so that they get coated in the olive oil and lemon dressing. Taste, and add more lemon juice or salt as required. A twist of white pepper might be a good idea too. Set aside to cool. And now we can get on with scampi work. To this pearly white colour in just about two minutes. Drain straight away. Allow to cool. Once cooled, dribble a tiny amount of olive oil over them. This recipe is all about ‘coating’ with olive oil. If you can’t get olive oil, by all means use melted butter. Drain the onion and celery and add the scampi to the pretty picture. Then make the salad by combining all the ingredients, using your hands, very gently. Do you like the glisten? that’s the olive oil. Ready to serve, at room temperature – or even cold if you are somewhere hot. It was really very very good. Tasty without being over the top. I’ve got a thing about pomegranate at the moment. Can you imagine how pretty this would look with red jewels of pomegranate in it too? This is one of those posts where I ramble and waffle on quite a lot. If you think you might be interested in the recipe, you can skip the following paragraphs and go straight to where photos of the recipe begin. Last Saturday there was a full moon … a big, fat, round, huge sphere and orb of a moon called a Hunter’s moon. And the word ‘hunter’ in Italian, “cacciatore”, immediately recalls quails to mind for me. Well, thrushes too. And ‘beccacce’, woodcock. And the odd pheasant. I come from an Italian family of men who liked to go out hunting, indeed had a passion for “andare a caccia” – my grandfather Riccardo who unfortunately died before I was born, his sons Felice and Toto, and Felice’s son Riccardo. Even my brother-in-law Enrico is a cacciatore. When my Swedish father died and I was less than one year of age, my mother decided to return to Italy from Sweden, and what ended up happening was that my widowed grandmother and her son Toto (who is only nine years older than I am), and my widowed mother and myself all lived together in the same flat in Frascati while I was growing up. And this is the flat that I have always called ‘home’ and am still in living in now! By the time I was five, my mother married again to a Scotsman who lived in West Pakistan and I learnt to speak English there, in Karachi. Stewart, my stepfather, was in the pharmaceutical business and work was to take him and his family (I have two younger sisters) to Iran, East Pakistan (which then became Bangladesh), the Lebanon, India, and Cyprus and back to the Indian Subcontinent. At age thirteen, I was sent to boarding school in England and spent six years there completing my education. This peripatetic existence is the fabric of my psychology, I am sure of that … and there is an expression for people like me now, “third culture kids”. Only a few days ago, I went to the Swedish Embassy in Rome to renew my passport and for the umpteenth time (think six decades) had to undergo the excruciating embarrassment of owning up to the fact that er, uh, ahem, I actually do not speak Swedish. Not much, anyway. It is not something that I am proud of and will have to make good on a promise I made to myself years ago to reach at least a reasonable conversational level. Anyway, let’s get back to shooting and such. During the course of my early childhood, I have blurred memories of my grandmother sitting in the kitchen of our apartment and painstakingly plucking away at the feathers of the tiniest birds imaginable (thrushes amongst these). I also remember, later on, when I was older, my Uncle Toto fabricating cartridges for his gun … the gunshot, the powder, the lead (was it lead?) stopper. He had all the stuff laid out on the kitchen table, all the various ‘ingredients’ carefully measured and then stuffed into the cartridge. Who knows? I probably even helped him on occasion. And then, when I was old enough to realise the chronological onus of hunting (getting up at around 3 a.m.), I thought he and my other uncle Felice and other hunting cronies were nuts. The birds they brought home almost looked like toys, they were that small. But my grandmother and mother always ooohed and aaahed, and so I just took it for granted I suppose. Having a gun in the house. My stepfather had an army background and was a crack shot apparently. And on those occasions when we spent New Year’s in Italy, I have a pretty clear memory of my Uncle and Stewart firing off a few shots after midnight. They fired in turns, aiming the gun high up into the sky. And .. yes .. no one was ever hurt, not ever. But imagine doing that now, eh! I shudder just to think about it and yet it seemed harmless enough, and fun, at the time. Stewart adored quails … and indeed, it was the dish that my grandmother would always make for him upon his return from abroad, and when the season was sound, they were usually accompanied by pan fried porcini mushrooms. He would start out with the mandatory knife and fork and end up using his fingers to pick away at those little birds until he cleaned the bones of any flesh, taking his time, enjoying every morsel. I seem to remember my grandmother stuffing them with sausage meat and roasting them in the oven. I instead cannot lay any claim to quailmanship. Not really my thing. I have to thank my friend Liz Macri for reintroducing this fowl on our dining table. She invited us to dinner just over a year ago and served them and we all thoroughly enjoyed them, and their ‘simplicity’. She roasted them in the oven, with a little bit of olive oil and salt and pepper, and that was it. When I espied quails at the butcher’s the day after the Hunter’s moon… I smiled inwardly, thinking about my Nonna and Stewart, and bought four for me and my husband’s supper that night. I happened to have a gaudy persimmon and plopped it into the roasting pan for a bit of colour and for a sweeter ‘take’ on the recipe. I dotted a few small tomatoes and voilà ! Slice the persimmon and serve the quail with paprika roasted cauliflower. Not a bad way of coming to terms with Autumn. Here are the dinky quails. The butcher hadn’t got rid of all the feathers and I had to do a bit of plucking myself, not the easiest of things and I had to resort to kitchen scissors in the end. I wrapped some garlic inside a small bayleaf. And then stuffed the garlic and leaf into the bird’s cavity. I sprinkled plenty of salt over the birds and coated them, and more bayleaves, with olive oil. I planced the persimmon in the middle of the oven pan. I did not use pepper because I think that it is best to add pepper freshly, just before eating, otherwise its fragrance tends to get lost. I then added some slices of ‘guanciale’ (pork jowl – pancetta would do too) over the opening to the birds’ cavities, a bit like an apron. These birds have hardly any fat on them and it was an extra precaution as to their maintaining juiciness during the process of cooking. I added the small tomatoes just for scenic effect. Now that I think about it, once the birds were cooked I could have dotted the plate with pomegranate. I roasted them in the oven at 200°C for about an hour and then turned them over for another 15 minutes. I sliced the persimmon and served the quail with roasted cauliflower. I had seasoned the cauliflower with olive oil, salt and paprika. This looks like a mess, doesn’t it. The photo below is a bit better. Anyway, looks aside, it tasted really nice. Not at all aggressive but full of flavour. Roasted persimmon is very discreet that way. The bayleaf is fresh. I went to a delicious Vietnamese cooking class the other evening, held at “Latteria Studio” in Trastevere in Rome and conducted by the very gastronomically talented and simpatica Alice Adams, who hails from Melbourne but has lived in Rome since 2005 (www.aliceadamsfoodstylist.com/about). We began with Fresh Rice-Paper Rolls and this entailed soaking the round rice paper sheet into some warm water and placing it on the marble top, easy enough. Then placing the filling in the middle, again easy enough. But then we had to wrap the roll – and it was incredibly sticky and gossamer thin and involved a lot of concentration and delicate fingerwork. “A big fiddly, eh Alice, “ I commented as I looked askance at my work, “My roll looks like a huge suppository gone wrong”. Then we dealt with pork and lemongrass dumplings – which are very similar to ravioli in looks and, again, a bit on the ‘fiddly’ side to execute. At which point I was prompted me to comment upon the fact that yet another plus side of Italian food is its relative lack of fiddly components. It is relatively easy to make a three-course Italian meal in under an hour. Anyone who has been reading me since I began blogging in September 2010 knows that I tend to eschew ‘fiddly’ not out of dislike for the niceties of top level culinary preparations but on account of the more mundane reason that I am not the most patient of people. Funnily enough, back in the days when people used to type on a typewriter and mistakes were corrected with a white polish called ‘tippex’, I was one of those who was surprisingly good at whitewashing the wrong-doing. The whole process was incredibly fiddly and one would think that all that tippexing would have honed my dexterity in the kitchen but no, that is not the case. I tend to be more like Alexander the Great and look for ease of action these days; if I see a Gordian knot anywhere in the kitchen, I either refrain from making that recipe or else look for a cheat’s way of dealing with it. But not last night. My friend Jack likes the classic clam pasta dish called “spaghetti alle vongole” and since yesterday was his last night in Italy before returning to Canada, I thought I’d make it for him. Sometimes, the devil is in the details that have to do with one’s amour propre – and I do think that the Vietnamese cooking class the other night sort of goaded me into wanting to cook something more sophisticated, more layered, more finished, in other words: more ‘fiddly’. I am glad to say that this extra effort paid off, and can immodestly claim that it was bloody good. Jack was flatteringly approving of this seafood pasta recipe and so I have named it after him. If you want to try it out, let me tell you what the ingredients are. Top quality pasta. The best extra virgin olive oil you can muster. Fresh clams, mussels and king prawns. An onion, peppercorns, parsley stems and leaves, a small tomato, some chilli for the fish stock/bisque. Garlic. Basil leaves and toasted pine nuts for the pesto finish. Italian breadcrumbs (or panko I suppose will do) to toast just before serving the pasta. Salt and pepper. Secret ingredient (well, not so secret now): ice cubes. There are a few steps to be followed. First the bisque has to be prepared. The pesto too. And the breadcrumbs toasted. The clams and mussels need to be steamed in the bisque and olive oil and garlic, and some of their shells removed. Finally, the pasta needs to be cooked first in the pot of boiling salted water and then in the pan with all that delicious steamed seafood in it. 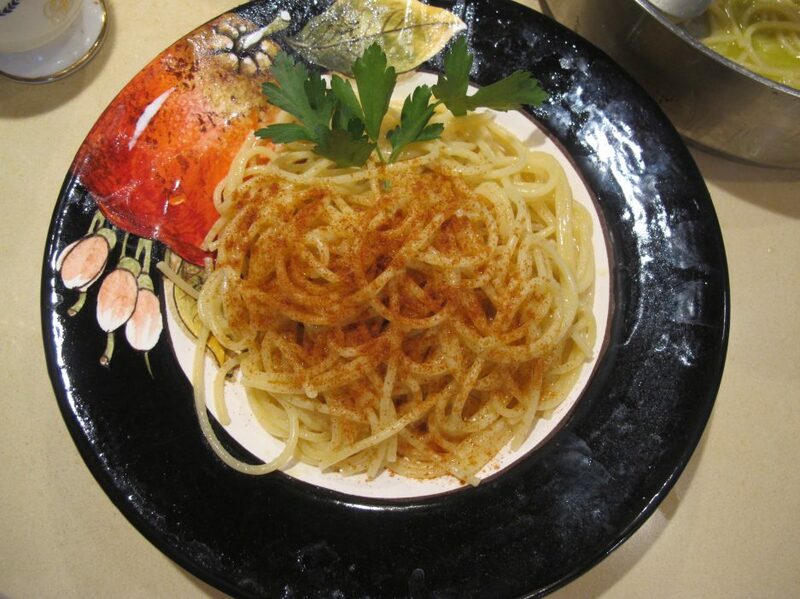 Once cooked, the pasta is placed in a nice plate and daubed with the pesto and showered with the toasted breadcrumbs. Here was my choice of top quality pasta – the Mancini brand spaghettoni. Venus clams on the left, mussels on the right. The clams need to soak in salted water (at least 20 minutes) and then shaken about and rinsed a few times to make sure there is no nasty sand lurking about. The mussels need to be cleaned too and trimmed of their hipster beards. In terms of quantity: think 200g per person for the clams and as for the mussels, about 6-8 per person. Here are the king prawns : in terms of quantity, think two per person. They are king sized after all! The shells/carapace of the prawns needs to be removed. Place the denuded prawns inside a bowl with some cold water in it, enough water to cover them completely (we don’t want them to dry out). Place the prawn shells in a pan and turn the heat on. Avail yourself of a wooden spoon and just ‘stick it’ to those shells – be brutal and thuggish with them. Mash them up even, because the more you break up their fabric, the more taste will be released. Apologies for the ‘steamy’ photo but it’s hard to cook and take photos at the same time. Then switch the heat off and … weird, I know … place some ice cubes into the pan. Use the wooden spoon in a more gentle fashion now, and swirl those ice cubes around until they fully melt. The reason for the ice cubes? Apparently, they activate something called ‘thermal shock’ which stops the heat of the cooking temperature in its tracks, and for some chemistry reason that is beyone my ken enhances the final taste. Now, at this point, it is time to add some usual suspects … so I have half an onion, a datterino tomato sliced in half (tomatoes add the oft-required acidity to any dish), parsley stems and peppercorns (they are there but are hiding in this photo). Add water. Enough water to cover all the ingredients and then about another 3 inches on top of that. Turn the heat on and cook for 10 minutes with a lid on. Then remove the lid and cook the liquid down for about another 10-12 minutes over a medium flame. Strain all the ingredients and you end up with this fishy tasting water known as bisque. Throw away the shells now but keep the precious bisque, put it in a saucepan which is large enough to contain all the pasta, and place it in a safe place for now. Toast the pine kernels/nuts, and be careful to do so over a gentle flame – they burn in no time! Remove from the pan and allow to cool. Then place a large bunch of fresh basil leaves in a bowl, pour a good amount of olive oil over them, add a pinch of salt and a twist of pepper, as well as the toasted pine nuts, and using an immersion blender, magically turn everything into a ghoulish green paste very similar to a pesto. Taste and add more salt and pepper if required. Put a tablespoon per pasta serving (think of one serving as 100g of pasta) of breadcrumbs into a non-stick pan. Dribble olive oil à la Jackson Pollock over it. And cook over a low heat for a minute or so, stirring constantly with a wooden spoon. Remove from heat and set aside. So, at this point: we have made the bisque. We have made the green basil sauce (pesto). And we have prepared the toasted breadcrumbs. We are on a roll. Which reminds me, put the pasta water onto boil. Now is the time. Put a lid on the pan, it boils quicker that way. Use as much or as little garlic per person to season the olive oil (at least one tablespoon per serving, and I would recommend even slightly more). Add some chilli (again as little or as much as you like) to the pan with the olive oil in it. Turn on the heat and cook the garlic (maker sure it doesn’t burn). It is surprising how much garlic is required to make this dish taste good. Normally, for other recipes, I would use less … but for this recipe, I used two cloves per person, and sliced them lengthwise in half. Pour this into the big pan. Time to steam the mussels, clams and prawns. Place them in the big pan, cover with a lid and cook until they steam open (only a few minutes). When they have, remove the lid and add a fistful of parsley leaves. Once the pasta has reached a rolling boil, salt it, and add the pasta. Fiddly Factor: You are going to cook the pasta for only HALF the time recommended on the packet. You will finish off cooking the pasta in the large pan with the seafood in it. And so now the tempo charges up. This is when one has to keep one’s wits about one’s person and can’t be interrupted bar any emergency. Looking good and smelling divine but we need to remove some of the shells. Asbestos fingers are required for this job, beware: the shells are indeed hot. These can be thrown away now. Add the half-cooked pasta. Now is the time to stir. A vigorous stirring of the pasta, until it soaks up all the liquid, and Jack’s the man for the job. It might even be that the pasta is still too ‘al dente’ by the time it has absorbed all the liquid: in which case add a ladleful of the cooking water. Transfer the now cooked pasta into a serving dish. And sprinkle the toasted breadcrumbs over it. Place the prawns where they can be seen, on top of the pasta. Create a circle and add a daub of the green sauce in the middle. Always a pleasure to cook for you Jack. Alla prossima. My cup runneth over … literally. I have been drinking more wine during the last ten days or so on a daily basis than I have since the last time I was spending time with a group of friends and/or family for a few days in a row (which happened to be last August). I live for get-togethers and I do love to cook and eat well, eat good food. It doesn’t have to be complicated but it does have to be good. I am known for having shed a tear when a highly awaited dish proved to be direly disappointing. I very rarely drink at lunch time because it makes me sleepy afterwards and my energy levels tend to take a dip in the afternoon anyway. Come dusk or soon after, however, and I have an appointment with “wine o’clock”, a time of day that varies with the seasons, sooner in Winter and naturally later in Summer. In either case, if I don’t have a yearning for a glass of wine by 8 p.m., I begin to worry about whether I am coming down with something. A fairly long time ago now, I accompanied a group of girl scouts on a camping trip and was able to forgo wine for those three days sans problème and that experience reassured me that I wasn’t a lush. There have since been similar other occasions, admittedly not many, when for whatever reason I had to do without and was absolutely fine with it. I know of a few people who do not enjoy wine at all (a lot of my Italian girlfriends for instance), or who alter their temperament in a dispiriting way (“j’ai le vin triste” was the lament of one of my friends who was otherwise not at all a cheerless person), and some get contentious, confrontational or even aggressive after drinking more wine than they can handle. Me? I talk. And talk and talk and talk. And save the world. And look at the greater scheme of things. And come up with brilliant ideas that I promptly forget the day after. And tell people how much I love them or appreciate what they have done for me, even though they know full well and I’ve told them countless times before. And after talk, talk and more talk, if I have drunk more than my quotidian usual, I just fall asleep, the Latin god of sleep Somnus comes to fetch me, we’re pals. Morpheus, the Greek god of dreams, sometimes has a heyday (heynight?) with me and the next day when I wake up there are not a few questions coursing through my mind before I get on with the day. Mostly, however, and here is the point of this oenologically imbued preamble, wine makes me feel good, takes the sting out of a long working day or lessens the hold of an ongoing worrisome problem, and opens up my mind to the probing question of what makes life worthwhile. Some examine life through vocation, religion, work, sport, meditation, art, music, physically challenging adventure, travel … there is no cut and dried rule and no one of these necessarily negates another. I find it pleasant and meaningful to undertake all this examining stuff around a meal, that’s all. A meal with a friend, a lover, a husband, a family member, a new acquaintance. It’s one of my ways of feeling ‘alive’ as opposed to merely existing. It’s one of the reasons I started my first blog (www.myhomefoodthatsamore.wordpress.com). Yes, the idea behind the blog was that it was supposed to serve as a marketing tool to entice people to want to come and do a cooking class with me in Rome (or in Frascati which is near Rome) but at the time I had one child abroad at university and another child who was going to go to uni in London too the following year. I nearly always had my children in mind as I wrote those posts, it was my way of extending the concept of ‘home’ to them at a stage in their lives when they were getting to grips with leaving home and my husband and I with the metamorphosis of the family nest. I also nearly always had one or another friend in mind, hoping that he or she would enjoy my post in lieu of a letter, an email or a phone call. Writing posts can be very difficult, I don’t think many people realize this, it requires a right ‘frame of mind’ – well, it does for me at least. I shop for food and cook nearly every day of the week and don’t find that a ‘problem’, and it only turns into a chore when I’m in too much of a hurry or when I have too many other things to do. Writing about it all, however, takes mindfulness as well as practical considerations and time. And when life gets in the way, the will to write posts dwindles however stalwarth the desire to keep up. I like my posts to reflect good cheer … I quote the following proverb on my About page: “He that is of a merry heart hath a continual feast (Proverbs 15:15)”. So yes, put it this way, I have been doing a helluva lot of ‘examining’ these past five years, these past six months. And, perhaps desultorily, not surprisingly, without any claim to a wow factor, all I can say is that it is love that makes life worthwhile. Love of children, family, friends, husbands and wives, colleagues, neighbours, strangers, pets. I woke up this morning fully refreshed after a lovely dinner last night with some of my neighbours. Tonight there will be a party in Rome at my brother-in-law’s restaurant with mostly Italian friends and family. And tomorrow there will be a party held in my honour, again in Rome, hosted by friends who are visiting from Canada … and the list is mostly comprised of other non-Italian friends who used to live here and who like to return as often as they can. Yesterday I was 59.8 years of age, tonight I shall be 59.9 and tomorrow I shall be hitting my sixth decade. I awoke full of gratitude this morning. My cup overfloweth. A bit tired but lots of cheer coming to the fore. I still have the kitchen to tidy up and clothes to hang out to dry. Phone calls to make. Cake to pick up. Emails to write. I went to a catholic boarding school in England and there used to be a hymn that we all adored, “The Lord is my Shepherd”, the Henry Smart musical version. I could never hit the high note but never mind. I am no longer a catholic but that does not prevent me from appreciating music and words that move one. And I think that one can experience love and gratefulness as a Hindu, a Muslim, a Buddhist, a Jew, a Christian, an Atheist. This was the purpose of my blog post this morning. If you are inclined, do listen to it … https://www.youtube.com/watch?v=k0XwLfRY1VQ – I like the line “I will not by evil be ever dismayed”. There is much to be dismayed about in the world and we all have to do something to keep up and forward some good news! Dedicated to Sarah Terzeon, Jenny Clark, Maggy and Glyn and Penny Averill in the UK, Alison in Samoa, Romina in Pakistan, Charlotte in Denmark, Debra in Hong Kong, Rosheen, Phyllis and Sandy in Canada, Diane, Judy, Kim, Elatia, Libby and Alanna in the USA, Jonell in Venice, Rachel, Maggs, Susy, Liz, Michelle, Victoria, Carmen, Judith Rose, Elisabeth, Carmen and Meera mostly here in Rome, Leanne sometimes in Rome, Marion, Tanya, Sally, Maeve, Frances and Pam from boarding school days, Aniko and Szuszanna in Hungary, my lovely family in Sweden, my husband’s cousins Gina, Gina and Gina in the USA, and my fantastic sisters J and J … I know you are the ones who read me the most.